Hating Israel can become difficult providing you look beyond the emotional outbursts. For those who simply dance to the conductor’s rhetoric and refuse to be curious, then hating Israel becomes simple; you just believe everything you are told and when told to jump, you simple ask how high. You do not need to ask what direction because you have practiced the jump and have it down to a ‘T’ after doing it at demonstration after demonstration. The problem is that many of the tropes told about Israel simply are false. That’s right, there are many lies told about Israel which dissolve with the slightest research. Probably the greatest lie about Israel is that the Zionists destroyed the nation of Palestine and ethnically cleansed the region and the refugees are the few who managed to escape the Jew caused carnage. The first problem is there has never in all of history been any nation anywhere called Palestine. There was a region named Syria-Palaestina which was a Roman province between 135 AD and about 390 AD. This had been the province of Judea which had been the southern kingdom that remained after King Solomon’s reign. When King Solomon died the Jewish kingdom of Israel split into two kingdoms. The northern kingdom remained named Israel as it contained ten of the tribes and the southern kingdom held the two tribes and took the name of the larger tribe, Judah. The northern kingdom was conquered by the Assyrians and they assimilated and were thought lost, thus the Ten Lost Tribes of Israel. Judah was conquered later by the Babylonians. From there they were conquered by the Persians, the Greeks and the Romans. The Judeans overthrew the Greeks once only to be reconquered, overthrew the Romans three times only to be reconquered each time. After the third time the Romans dispersed the Jews, as the Judeans were now called as the Romans were too lazy to use their full name, sending them throughout their empire in the hopes that this would cause the Jews to be erased from history. The Romans had done this with the Carthaginians which is part of why we do have Carthaginians around now. After the third time the Jews were overthrew, the Romans also renamed Judea, calling it Syria-Palaestina as part of their erasure of the Jewish People. The British, after taking the area from the Ottoman Empire continued using the name for the region Palestine as the Ottomans kept the Roman name as had the Caliphate before them. People are often quite lazy and rather than redraw all the maps they simply keep the names. There was never a nation called Palestine or a people called Palestinians other than the early Jews. When the British referred to Palestinians, they were referring to the Jews. So, what did they call the Arabs who lived amongst the Jews? Well, they called them Arabs or Jordanians, Syrians, Yemenis, Saudis, Egyptians, Iraqis or even Turks. When did the Arabs become called Palestinians? We can give you the exact date for that as it is known. The Palestinian Liberation Organization, a product crafted jointly by the Arab League and the Soviet KGB, was brought into existence on May 28, 1964, with the presentation of the Palestinian National Covenant, which is a revisionist and combative anti-Zionist statement dedicated to the “restoration of the Palestinian homeland.” That was the day that the Arabs stopped being Arabs and no longer had their original national homes and became refugees of the imaginary former nations of Palestine and they immediately started to rewrite a revisionist history using the history of the Jewish People and replacing the Jews with Palestinians. In a frenzy of anti-Semitism, much of the world, especially Europeans and the Muslim world, took to this revisionist history as they wished to assist in the destruction of Israel as the return of the Jews to Israel fulfilled Judaism and the prophesies of their eventual return to their ancestral home. This was the story of the Dry Bones which Ezekiel had prophesied in the Bible. The return of the Jews to Israel also is a refutation of replacement theology which is practiced by numerous Christian mainline churches and by Muslims. That makes the Jews return to Israel a threat to these religions. If these churches can remove the Jewish nature of Israel, then all would be good again. Then there is the cry that Israel is attempting to conquer all of the Middle East and establish what is called “Greater Israel” reaching from the Euphrates River to the Nile. This is wrong on its face because Greater Israel reached from the Euphrates River to the Wadi of Egypt (see map below), which was the border between Israel and Egypt in ancient times. There was a time when Greater Israel existed during the rule of King David and King Solomon which was actually a federation of smaller kingdoms which pledged loyalty to these Jewish Kings and paid taxes in exchange for protection from the kingdom of Israel. This was the empire which nobody ever taught about and it reached to the Euphrates River to the Wadi of Egypt as Egypt and Israel had fought a number of conflicts and no longer desired to war any further. 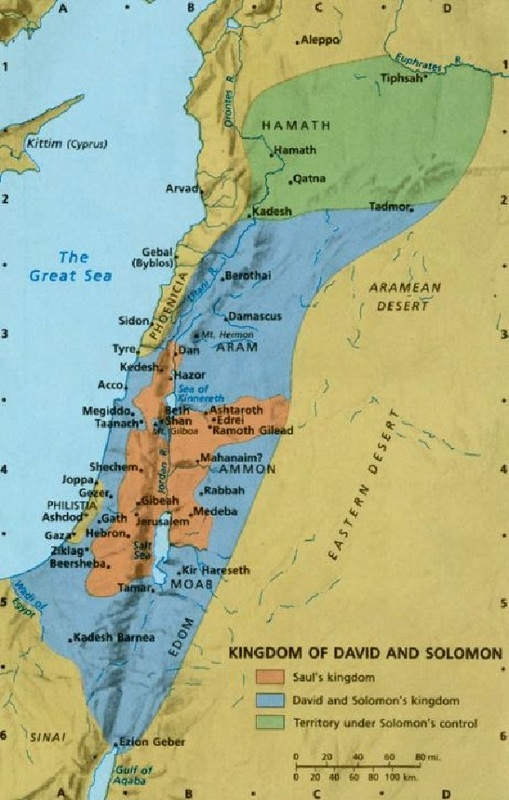 Kingdoms of Kings David and Solomon existed from approximately 1050 BCE to 930 BCE. What was interesting about this period was that there were no wars in the known world of the time and it was not until the state of Israel broke into two kingdoms as related above, the northern kingdom remained Israel and the southern kingdom was Judea, named after the larger tribe. Then came the rise of the empires you read about in history, the Assyrians, Persians, Greeks, Romans, Caliphate, Ottomans, Austria-Hungarian, Russian, Spanish, French, British and the others. These all were formed through war and remained at war until they ended and were not harmonious with each attempting to force the conquered to adopt their way of life and religions. Kings David and Solomon did not force Judaism on any of the vassal states but allowed them to continue to worship their gods, be they stone idols, golden idols, great being who lived atop a distant mountain or whatever beliefs they held. Like today, King David and King Solomon basically conquered to the borders of the original lands and after that, they assisted allies to defeat their rivals incorporating them into the areas under their protection. Today Israelis have a far less demanding desire, we just desire to be granted the lands we were promised. Under the original design, Israel was supposed to be formed in the area which today makes up all of Israel, Gaza, Shomron and Jordan, the entire British Mandate. The British remembered their promises to the Arabs and reached an accord with the Zionist Congress which divided the British Mandate along the Jordan River. The eastern 78% was to become the Arab land which today is known as Jordan and the remaining 22% was to be the Jewish State of Israel (see map below). This started with the San Remo Conference and the Treaty of Serves to the Mandate System which was approved unanimously by the League of Nations and then adopted by the United Nations as Article 80 in their Charter. This is the entirety of the story until the world decided that the Jews were being granted too much land and they might actually be capable of defending their borders. This led to the proposal from the United Nations General Assembly of Resolution 181 on November 29, 1947. This divided the western 22% of the British Mandate in half again with much of Israel being the Negev Desert. Since this was a General Assembly Resolution, it would only be applicable if all sides involved accepted the terms. The Zionist Congress and initial Israeli government which were being formed agreed to the plan but the Arab League refused to accept the plan. Why did they do such a thing when they could have had their presumed desire, Palestine in half the land. Well, that is easy, they refused because the Jews still would have their land and Jews can never be permitted to rule themselves, they must be subservient to Islam and the Muslims who practice Islam. This was why on the morning that Israel came into existence, with the borders from above as Resolution 181 was refused by the Arab League thus making it voided and no longer even a plan, there were six Arab armies which invaded Israel in what they termed a genocidal slaughter, as the Arab League’s Secretary-General Azzam Pasha was quoted when asked for his estimate of the size of the Jewish forces, Azzam Pasha waved his hands and said: “It does not matter how many there are. We will sweep them into the sea.” Azzam Pasha was later quoted claiming, “I personally wish that the Jews do not drive us to this war, as this will be a war of extermination and a momentous massacre which will be spoken of like the Mongolian massacres and the Crusades.” One need remember that the Arabs attacked on the morning of May 15, 1948, the morning of Israel coming into existence while some Arab forces attacked Jewish communities starting the day after the United Nations Resolution back on November 29, 1947. Meanwhile, as far as the United States aiding Israel, history tells that United States Undersecretary of State Robert Lovett argued, “Obviously, the Arabs might use arms of United States origin against Jews, or Jews might use them against Arabs.” Consequently, on December 5, 1947, the U.S. imposed an arms embargo on the region. The United States would not adopt aiding Israel until after Israel won the Six Day War in June of 1967 when President Lyndon Baines Johnson took note of the Israeli success and decided that maybe they would make for a strong ally. Yes, the United States took to Israel in value of Israeli strength and the fear that the about to be produced Lavi fighter jet would be a competitor for the American F-16 and thus they gave Israel a grand bargain if Israel would not make fighter aircraft, but that is another story. The argument that Israel forced the Palestinian Arab refugees from their homes is the next fabrication. The Mufti of Jerusalem and the Arab Armies’ Commanders told the Arabs to leave their homes so that the invading armies could simply murder everybody they found as they swept to the sea and the Jews fell before them. The majority of the refugees came to be from these Arabs who left as they were promised they could have the spoils from the Jews once the Jews were eradicated. The only thing they did not believe was possible that Jews could defeat the forces fighting with Allah. The Jews won the war by not being slaughtered to the last but lost the Shomron and Gaza with Egypt taking Gaza and Jordan actually annexing the Shomron renaming it West Bank. There were some Arabs forced from Israel during the war but the majority of these were from villages which assisted the fighters or were attacking the Israeli forces behind the front lines. There was a percentage which was evicted for tactical means such as when the Jewish forces were making their way into Jerusalem in the last moments so as not to completely lose this precious city, the crown of Israel. These refugees have been kept in camps outside of Israel to be used to conquer Israel with the Right of Return, a phrase also taken from the Jewish story. What the world had forgotten is the Arab world forcing almost every last Jew from their lands. These Jewish refugees were thrown from their homes and penniless and as no nation was taking them in unless they had relatives, and then only if their relatives took legal financial responsibility for these refugees. Thus, they mostly ended up in the one nation who took them with open arms, Israel. These almost million Jewish refugees were accepted and immediately merged into Israeli society and were not left as refugees. They are now many of our leaders and innovators, not perpetual refugees. The Arab refugees are also the only refugees in the world who pass their status to their children generation after generation and were given their own agency, UNRWA. Many of the things Israel is accused of are straight-forward anti-Semitism in a new package. The claim Israel controls the United States Congress is the old canard that the Jews manipulate governments of the world. The claim that the Jews of the world support Israel more than they do their own country is simply ridiculous, especially when often some of the speakers at such rallies are Jews who wish Israel were not Jewish or even did not exist at all. There are claims that the mainstream media refuses to criticize Israel as they control the media or own the media. This is another old canard against the Jews. What has happened is that many of the old anti-Semitic tropes have been adopted replacing Jews with Israel and slight wording changes to accompany the new noun. If you were to listen to much of what the speakers claim, they are forms of the above or claims that the Jews took over an Arab nation which never existed, Palestine. Then they will claim that Israel is an Apartheid nation despite having had Arabs in the Supreme Court and an Arab Party with representatives in the Knesset, the parliament, Arab doctors, nurses, managers, scientists, teachers, police, politicians and in every walk of life. Arabs have all the rights any Israeli has and have full citizenship in Israel. These Arabs are the actual or children and grandchildren of the original Arabs who decided not to leave when the Arabs demanded they leave, some even fought with the Jews to defend Israel in 1948 and some are in the IDF including officers and pilots. Then there is our favorite, that the Jews have not permitted the Palestinians from having an election since 2005. Israel does not rule the Palestinian Arabs about who this claim is made. The Palestinian Arabs under the Palestinian Authority have their own leader, Mahmoud Abbas, and their own parliament. The Gazans are ruled in a dictatorship run by Hamas and Islamic Jihad and in a dictatorship one does not get to vote, but Israel has no say in that side either. The Palestinians have not had elections because their rulers do not want elections because they are getting wealthier than one can imagine off stealing aid money coming from the anti-Israel forces. These include the United Nations and European Union at the top of the list. Look into what we have written here on your own and you may be surprised. The research you do, please share it with others you know who are against Israel, please. Why not have us start with the biggest misconception, the desire of Israel to form Greater Israel. This is an accusation which most using it know that it is their really big lie. Greater Israel was the Israeli Empire of Kings David and Solomon (see map below). Their empire reached the Euphrates River at its northern point and the Nile, so to speak, to its southern edge. What one has to remember is that whenever your border met the border of Egypt in ancient times, that was considered as bordering the Nile because between the Egyptian border and the Nile were a few small settlements, and a select group of cities which grew around the defensive fortifications along the used paths of travel to central Egypt, the Nile. So the border of Egypt was basically the border of the Nile River as there was nothing of real substance between the border and the Nile River. So, the story of a Greater Israel is a historical reference to the hundred years largely during the reign of King Solomon and the second half of the rule of King David after he unified the Twelve Tribes and then set out on conquest. King Solomon completed the conquest reaching the Euphrates River fulfilling prophesy and retained a steady and peaceful border with Egypt. The Empire of a Greater Israel was an aid to the Egyptian Empire as it presented a safe border where there was agreement and little possibility of any aggressive actions. Neither Egypt nor Israel desired to go to war with the other as they were of relatively even ability and both would lose in such a struggle. There is no desire for modern Israel to extend her border any further than the boundaries defined by the San Remo Conference, the Mandate System and related treaties as well as Article 80 of the United Nations Charter making the Mandates enforceable by the United Nations. The United Nations is bound by its charter to enforce the promises made under the Mandates which set the eastern border of the Jewish State to be the Jordan River and had absolutely no mention of any Arab entity west of the Jordan River, Palestinian or otherwise. 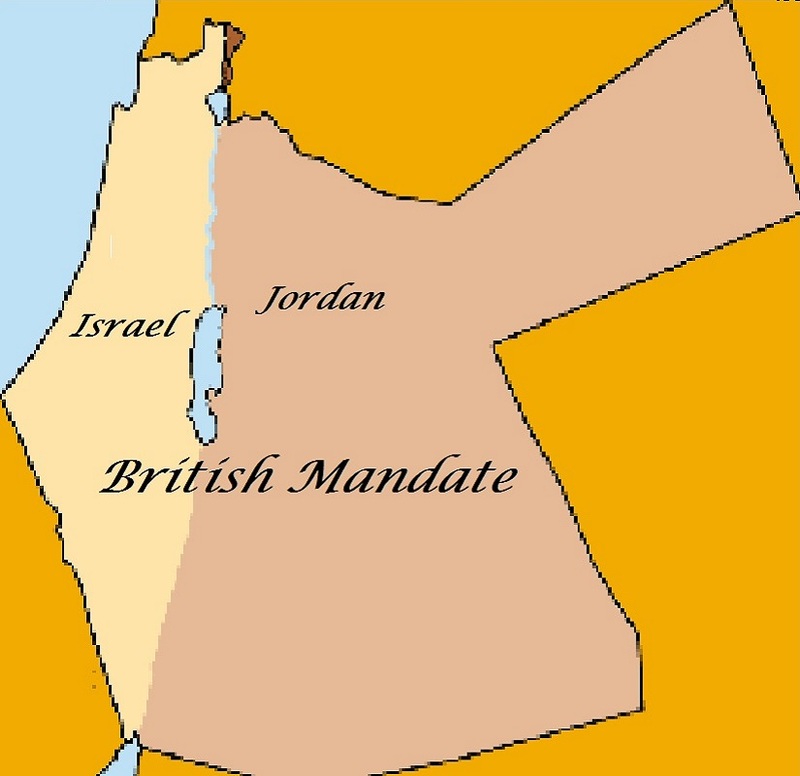 The Mandate set an Arab state east of the Jordan River which initially was named Transjordan and later simply Jordan. Despite all the various resolutions voted upon semi-recognizing an Arab Palestinian state out of what was promised to the Jewish State or the intentional harm allowed by President Obama in the Security Council on the Israel damning UNSC Resolution 2334 under Chapter Six authority which does not permit military force or other coercive force such as embargoes for enforcement, the United Nations under the charter, which overrules all else, must enforce as the eastern border of Israel to be the Jordan River. That is an absolute which any International Court would have to respect and use as the law on the matter. This is why the Arab world has never taken Israel into the International Courts at The Hague as they know any such judgement would further enforce the Jordan River border for Israel. After that has been settled, as if Israel were to sign a treaty giving the land away, which she has yet to commit, the sole means for such an Arab state to be formed, such as Hamastan in Gaza, otherwise Israel’s eastern border remains the Jordan River and beyond that there is no desire for reestablishing the borders reached by King Solomon in modern times. Another slander spread about Israel is the Apartheid accusation that the Jews have rights that non-Jews are denied, specifically the Arab Palestinians. There exist a very limited number of rights which are reserved for solely the Jewish People, but they would not rise to the level of Apartheid. The most obvious is the “Right of Return” for the Jewish People. This was something that the world agreed was understandable and the means by which the Jewish State would operate and be founded upon. Any person whose heritage by birth, or recognized conversion, is Jewish, is permitted to return to the ancient Jewish homelands and become a citizen. This was considered a basic and inherent right under which the Jewish State would operate and as the Jewish State, it would be ridiculous to claim others would have such a right. Jewish citizens upon reaching military age are required to serve in the IDF or perform National Service and this is not required of others with one exception; further the Druze or Circassian Peoples of Israel declared they too would follow conscription and serve exactly as the Jews are required and this was voluntary and decided as a community. Arabs, Christians, Bhai and other religions and peoples residing in Israel are not required to serve in the IDF though they may choose to serve voluntarily. There is a current discussion for expanding military service requirement to the Hassidic Jews. This has not been a right in which Jews are solely privileged to perform, as others are not banging down the doors demanding not to be excluded from inscription. These are the exceptions and beyond these, there is complete equality in Israel. Jews, Arabs, Christians and all other non-Jews have the rights to vote, live in any open community (there are exclusive communities such as religious, Arab, Bhai, Kibbutzim and a selection of similar types), work in any occupation, same healthcare system, join political parties, equality before the law, and everything else just as in any other democracy in the world. The Arab Palestinians do not have these rights because they are not Israelis, they live in their areas under their own governance headed by Fatah and the Palestinian Authority. The Arab Palestinians have not voted in over a decade because Mahmoud Abbas knows he would lose and that would likely lead to his being dragged before an Arab court and he prefers being President so he cancels the elections every time the time approaches. Israel cannot force them to hold elections any more than Israel could force North Korea to hold open and fair elections. The limitations on Arab Palestinians exist due to the fact that they are a foreign entity and are not Israeli citizens and the only citizenship they had before the Palestinian Authority was the older Arab Palestinian likely hold Jordanian citizenship and the rest are the offspring one or two generations removed from being Jordanian citizens. When Hamas and Islamic Jihad launch rockets or use tunnels to attack into Israel and it results in yet another Hamas and Islamic Jihad against Israel war, there comes the inevitable charge that Israel is using disproportional force as the fighting results in more Gazan civilian deaths than Israeli civilian deaths. There are any number of mitigating reasons of which the most urgent which are ignored are obvious to those who bother to try to find the reality. The largest reason is despite having sufficient tunnel and bunker space to place all the Gazan people underground and in relative safety, Hamas (and we will use Hamas to infer Islamic Jihad and their other allies) refuses to permit any of the civilians outside a select group who have sufficient wealth to purchase their own and family safety. Instead, they force the population to crowd into areas where Hamas is launching rockets or where Hamas is planning to encounter and fight the IDF. Hamas does this with the intent of causing civilian casualties. What is even more frightening, Hamas has been seen to entice children, using their youthful curiosity, to stand near their rocket launchers when they are launching rockets into Israel with the intent of their being struck when Israel returns fire to destroy the launchers. Additionally, Hamas, and friends, do not exactly wear uniforms and the major difference between a Hamas terrorist combatant and a civilian male Gazan of approximately the same age is, at most, a few grenades, an AK47 or similar assault rifle, possibly a sidearm or possibly operating a rocket launcher or mortar. When one of these combatants is killed, then his weaponry is removed and then they are pictured by the media and counted as a civilian. 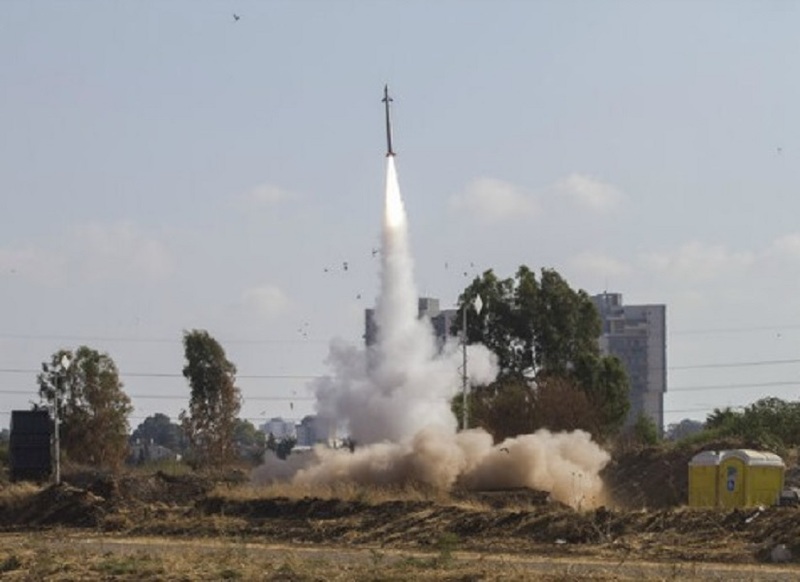 Additionally, when Israel calls people, drops leaflets, and performs other warning actions that they will be attacking a certain building or location, Hamas will call for people, mostly women and children, and have them stand on the roof of the building or surround the rocket-launching vehicle so that Israel will not attack and this works much of the time. It fails on occasion when Israel is using artillery or missiles and intelligence does not show the civilians who are still at the location despite the warnings from Israel. Too often it is later found from survivors that Hamas ordered the people to remain in a targeted building in order to cause casualties which they can show the media and claim Israel has intentionally murdered these people. There have been cases when Hamas rockets have misfired and struck within Gaza such as when the al-Shifa Hospital and Shati Refugee Camp were struck by Hamas fired missiles. This was proven by Israeli radar trajectory tracking systems which followed the track of four rockets launched (see pictures below) from a Katyusha multiple rocket launcher aimed at Ashkelon where one of the rockets was tracked. 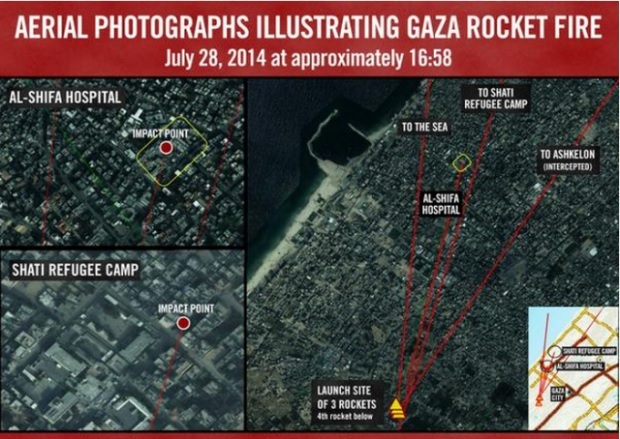 These misfires are shown to the media claiming that they were launched attacks from Israel. In Gaza, Hamas actually use civilians as human shields which too often results in civilian casualties. The simple truth is the Hamas does everything they can to maximize civilian casualties as well as using their own dead combatants to be stripped of weapons and also added to the civilian count. Israel works in the opposite direction from Hamas et. al. Israel requires new structures, be they apartments, homes, malls, office buildings or anything else, to have shelters capable of providing protection to the maximum expected count of occupants. These shelters also need to be within a certain distance to permit the people to reach them within a safe period of time which should be less than the flight time of any rocket or missile fired at them. Israel shelters their civilians while the IDF are the ones standing in the open seeking shelter only after they have marshaled all civilians into shelters. Israel has developed the means to intercept as many rockets, missiles, artillery and mortars such as the Iron Dome (see picture below). Israel invests millions of shekels if not billions or even trillions of shekels into producing a multi-level anti-missile interception systems including but not limited to the Arrow II, Arrow III, David’s Sling and the new Magic Wand, and these are the ones which we know exist and who knows what else Israeli scientists have designed and built that they have not made public. Israel protects her civilians placing the IDF between the civilians and the danger while Hamas place their civilians between their combatants and the danger. That is the real reason that there are far less Israeli civilians killed than civilians who are an unintended consequence of Israeli actions to defend Israelis when attacked by Hamas. Then there is the simple fact that disproportional use of force is a new and previously unheard of measure of warfare. Further, of all the recent and current zones where there is active combat or has had combat, the use of the measure of proportional or disproportional force as a measure has solely been applied to Israel. 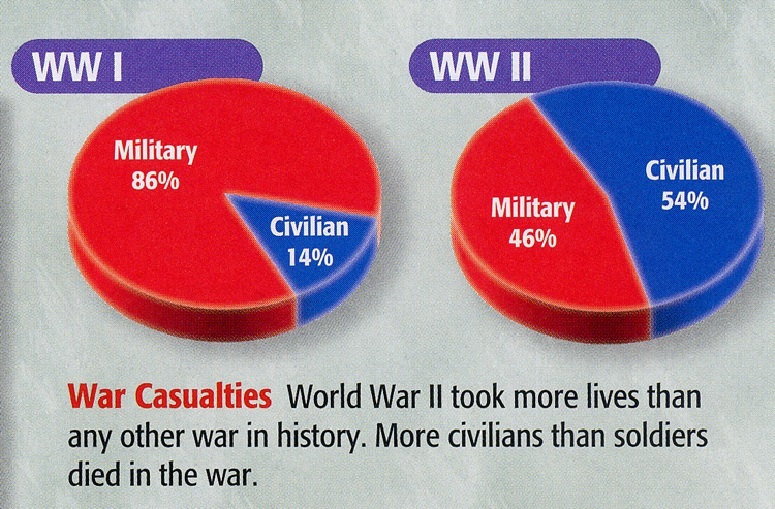 The ratio of military fatalities when compared to civilian fatalities changed drastically between World War I and World War II (see graph below). The United States had far greater than a ten-to-one kill ratio in Viet Nam when counting combatants. The United States has had almost unimaginable numbers of enemy civilian casualties compared to those suffered by the United States. In every war, there has been very few where the casualties, civilian or military, were proportional and the intent of any military for military combatant deaths is to cause the maximum while taking the minimal numbers. Simply stated, in war a disproportional ratio is what is the intent by both sides. The difference in the Israeli wars with Hamas is due to the intent of each side in their military strategies. Hamas aims to maximize civilian casualties on Israel as they target civilian targets while largely ignoring military targets while Israel intends to target Hamas combatants and uses the IDF to protect the Israeli civilians. Further, while Israel does everything in their power to limit civilian casualties on both sides, Hamas attempts to maximize the civilian death and casualty counts on both the Israelis and their own population. Hamas actually desires that large numbers of their population be killed or injured such that they can have as many pictures as possible to plaster over the front pages and lead news stories around the world. That is their operational strategy, have their own population injured and killed as widely as possible in order to accuse Israel of disproportional force while Israel goes beyond what any other military in the world does to minimize civilian casualties in Gaza as well as protect Israeli civilians. Quoting an investigative report into the IDF performance in the 2014 Gaza War found in this article, we quote, “Each of our own armies is of course committed to protecting civilian life during combat. But none of us is aware of any army that takes such extensive measures as did the IDF last summer to protect the lives of the civilian population in such circumstances.” So much for the claims that Israel has intentionally targeted civilians and the other accusations of disproportionality, an aim of every military in the world when entering combat that they will take few losses while causing maximum losses on their enemy forces. Then there are claims that Israel has attacked the democratic base of their governance. This claim is brought by Israelis as well as many groups from outside Israel. All of these groups have one item in common, they are far leftist groups. Their claim is that Prime Minister Netanyahu has to be fixing the elections to continue to win elections after election. There are a number of problems with these claims. First, one is that Benyamin Netanyahu has continuously led the Likud Party by decisively winning internal party elections time after time. Most of the other parties also have had the same people in the highest positions over the same period. The parties which have changed leadership are more often those which did not perform well or reach the level of representation in the Knesset that their membership anticipated. This is what has led to these leaders being replaced; Likud has done well so they have continued with what has worked. It is use of the formula of, if it is not broke, don’t fix it. Likud has been successful and thus they have been the party to choose the Prime Minister which has been their successful leader, Prime Minister Netanyahu. What these groups and politicians mean when attacking Israel as not being democratic and having murdered the previously great Israeli democratic history is actually very simply, they mean that their favored parties on the left have not taken power. Israel had leftist socialist governance until 1977 election of Menachem Begin. This ended three decades of Labor Party rule. Since then the left has won some elections but have mostly been placed in the opposition. Unfortunately, the far left have two easily identified political principles, the first is that they have a natural right to run the world and every nations in it and the second is that if they should lose elections then the only possible reason is that democracy has failed and broken down thus the reason for conservative governance can only happen by killing democracy. For further proof of this, one need simply look at the commotion gripping the United States and the anger generated by BREXIT across Europe. The election of Donald Trump, election of Bibi Netanyahu, and BREXIT are the recent proof that the world as we know it is going to explode and die and democracy must be in decline as only by cheating can nationalism or conservatism become the majority. Israeli political mood is religious, nationalist and capitalist with a touch of conservatism which means that everything the far left find putrid; nationalism, capitalism, religion and conservatism; are the items which appear to be driving the Israeli population and this must mean that it is impossible for democracy to operate as the left cannot appear to win elections. Trust, Israeli democracy is alive and well and quite active which becomes evident even to the most casual observer. Israel is simply despised because its existence makes so many beliefs people have held for close to two thousand years, namely that the Jews were finished and ready to collapse into extinction any day now. With Israel, we now have Jews with an Army and no longer the easy people to push around and blame for everything. Just because Israel exists and Jews are armed and protecting themselves has not quite sunk in, so the world is still blaming the Jews for everything, just now they are blaming the Jewish nation, Israel. Israel understands this as our history was a record of being conquered by empire after empire until the prophesy was finally realized, miraculously just as predicted by our prophets and written in the Old Testament, the Jewish Bible. With the reestablishment of Israel and the start of the ingathering has many people very nervous as they are not quite sure what this means. They fear it might mean the coming of the Messiach will be very soon and nobody believes we are ready for such an event. Others just resent Jews having their own nation and power. Then there is the fact that the land was one under Islamic rule and is in the heart of the base of Islamic power, thus it must revert to Islamic rule and the Jews need to know their place as dhimmis. Then Israel just makes a convenient target as the Jewish nation amongst all the other nations, many of which are of similar backgrounds. The real problem for Israel is it is the only nation with such an identity, a Jewish identity. That makes Israel the lone nation amongst nations which makes her a target. How has Israel responded? We attempt to assist nations in need, we invent technology, medical procedures, new items and all kinds of things which make life better around the world. There is one other item we in Israel have given the world which we like to tell of, we invented the cherry tomato. The renewed State of Israel just turned sixty-nine in the usual emotionally roller-coaster ride. In Israel there is an unique lead in to celebrating the rebirth of the nation state for the Israelite People, also known in modern time as the Jews (more on that in a bit). A little while before the celebratory day we commemorate the remembrance of those lost in the Holocaust. Then the day immediately before Independence day we commemorate all those who have fallen in our defensive struggle to remain a thriving and wonderful nation, but we might be a tad bit biased as citizens living in Israel and very happy with our choice to make Aliyah. Memorial Day includes the soldiers and civilians including Christians, Muslims, Arabs, Bedouins, Druze, Baha’I, other racial and religious peoples who are represented in the society which is Israel and, of course, the Jews. Memorial Day also includes all of the above who have died or suffered debilitating and life altering injuries due to terrorism. Needless to point out, this is a very solemn day filled with tears and sorrow until sundown. That is when a transformation takes place that unless witnessed is impossible to envision. Sundown on the Jewish calendar marks the start of the next day, Independence Day and some of the highest spirits and joyous occasions in all of Israel. People dance in the streets, sing joyously, some pray, some chant their prayer aloud in the street, others soak it all in and are filled with a satisfaction and a warm glowing joy. Then there are of course speeches by politicians (something we unfortunately cannot prevent as they will talk, that is their job, to talk us into submission), singing (this is great usually even if in Hebrew and you do not yet speak Hebrew), dancing both with and without singing, music and in the midst of all this they launch a good half an hour or more of fireworks, and all this is in the town center of one of the smaller cities in Israel. If one wished to sit atop one of the twenty or thirty story building’s roofs, then they could gather in the little fact that the suburbs, other downtown neighborhoods, the neighboring Kibbutzim and all over the area there would be other fireworks and the sky would light up in sparkling explosions and bright sprinkles of joy in almost every direction one would look, well, except west as the Mediterranean Sea is west of our town. Well, time for a short bit of history and why Israelite became to be known as Jews. If one were to take the refounding of the State for the Israelite People with Jerusalem as their Capital City, then Israel in approximately three-thousand-one-hundred-fifty-years old. That is because somewhere between 1,000 BCE and 1150 BCE King David took an elite group from his army and entered Jerusalem (Yerushalayim) in the middle of the night and took care of the majority of the night guard, took over the main gates and opened them to allow the rest of the Israelite army to enter Yerushalayim. From that day forward, Yerushalayim became the Capital City of Israel and the Israelite People such that wherever they would reside they prayed facing Yerushalayim. Many of their services, especially the Passover Haggadah, end with the final phrase of, “Next Year in Yerushalayim.” History would note that King David’s son, King Solomon would build the Temple to Hashem allowing for a place for Hashem’s presence on Earth to settle. The Ark of the Covenant rested within the Holy of Holies, the central chamber within a chamber within the Temple. Only the Cohen Gadol (Heb. כהן גדול) was permitted to enter and then only on Yom Kippur when he was to atone and account for the people’s sins and the state of Israelite society and its reverence towards Torah. The Cohen Gadol would have a strong narrow rope capable of dragging his remains from the chamber attached to his ankle in case the recounting went badly. There are many accountings of attributes, the positions the Cherubim would face atop the Ark of the Covenant and other strict rules on how the Cohen Gadol was to prepare for entering the Holy of Holies. Let it rest that we are quite glad that we could never qualify for the position. There was the instance when during a war the Israelites lost the Ark of the Covenant allowing the Ark to be captured in a battle they lost because they took the Ark of the Covenant without having been instructed by Hashem to do so. Things went quite badly for whatever city it was harbored. City after city would pass it off to save themselves and finally they begged the Israelites to take the accursed item back and never to allow it in their lands again. The Israelites took the Ark of the Covenant back with great joy and great care in handling the Ark. The Temple was subsequently destroyed by the Babylonians and the Ark of the Covenant was nowhere to be found and has remained in hiding ever since. Also between the building of the First Temple and the Babylonian conquest and destruction of Yerushalayim and the Temple when Solomon dies the nations split into two kingdoms, the Northern Kingdom held ten tribes plus their priests and was named Israel and the southern nations was called Judea as it was made up of Juda and Benyamin, two tribes and Juda was the larger of the two. Judea also controlled Yerushalayim. The Assyrians conquered the Northern Kingdom of Israel and never were they heard from until recently since the formation of the State of Israel, where these tribes emerge from around the globe and have proven genetic links to the Nation of Israel and the Israelite People. They were, and oft still are, referred to as the ten lost tribes of Israel. The Southern Nation continued until the Roman dispersion and their people were referred to as Judeans, which over time shortened and shortened until Judean became Jude and finally simply became Jew. While in captivity, the Babylonians demanded our Priests sing songs for them so they wrote the Song of Babylon, which includes a very strong reference to the special place Yerushalayim plays in the lives of the Israelites. The Song of Babylon is also known as Psalms – Chapter 137 and those special lines are below. Sing for us of the song of Zion. How shall we sing the song of the Lord on foreign soil? if I do not bring up Jerusalem at the beginning of my joy. Babylon fell to Cyrus the Great who received the title of Great because he allowed the Israelites to return home to rebuild their Temple and worship Hashem. Truth be told, just as in Egypt with the Exodus, far less than half the Jews took the offer to return and reclaim their lands and make them productive. Many claim that both times the number was merely ten percent, we like to believe we could get at least double if not two and a half times as many, a full quarter of the Israelites. But many remained throughout the Persian Empire. Things went well until a descendent of one of the Israelites old enemies came back to haunt them. His name was Haman and he was the Visor (top advisor) to King Achashverosh. King Achashverosh called for his wife, Queen Vashti and her reply was, “No.” This angered King Achashverosh so he had her removed from her position as the Queen by beheading her. King Achashverosh held a contest to choose a new wife; a Jewess named Esther won and became Queen of Persia. Haman persuaded King Achashverosh that the Jews were a threat to his throne and had a Royal Order sent to all the regions that the Jews be killed on a set day. Esther’s Uncle Mordechai told her of these plans and asked her to intervene with the King, which at first she shrank from the task, but was persuaded to act. King Achashverosh could not repeal his first order so he issued a new order demanding that the Jews fight back and let the true people persevere. Haman and his sons hanged on the very gallows they had built to use on the Jews and on that fateful day the Jews won out and more anti-Semites died that day than any other day in history. After this, there was a brief period of calm and then came the Greeks and Alexander who found circumcision to be abhorrent as they worshiped the human form and thought people to be born with perfection and it was an anathema to them to cut or change the body in any manner. Many Jews could not accept their making circumcision illegal and circumcision was simple to discern and once detected they faced sentencing to death. This caused them to live hidden in the caves of the Judean Hills away from the prying eyes of the Greek soldiers and officials. The Jews survived the Greeks despite many Jews being tempted and turning to following the Greek worship of idols. These were called Hellenized Jews and were very similar in many ways to the American and European Jews who have slowly over the years turned from their religion and now act as if they were gentiles in all manners except for attending church, but then many Europeans and a fair number of Americans, mostly leftists, also do not attend church. Then the Romans came replacing the Greeks and not much changed until the Jews managed to win their freedom briefly from the Romans who returned in force, defeated the Jews, and passed new restrictive laws in the hope it would break their will and force them to be Roman. Apparently, they were not familiar with Torah where the Israelites are often referred to as a stiff-necked people and stubborn beyond measure. The Jews managed the impossible and threw off Roman Rule a second time, Rome sent several legions, and this defeat was definitive. They dispersed much of the Jewish population to the far corners of their empire and everywhere in between with the hope that this dispersion would be the end of the Jewish People. Rome understood that a people without any connection to land became weak-willed and soon lost any mutual ties and became estranged and their being a nation terminated. The Jews were different because they were not tied to the land as much as they were tied to Torah, and the Romans could not take Torah away from the Jews, they had it memorized along with commentary, customs, celebrations and every iota which was within. This was the precious heritage that they passed on generation-to-generation and what kept the Jewish People defined as a people. It is Torah, which also is found in some traceable form that most of these tribes being discovered still observe to this day. They continue to observe the Sabbath from sundown Friday to sundown Saturday and hold the Seder for Passover and every other tradition plus a few new ones commemorating great miracles in their lives. All of this brings us to the pertinent question, did Israel just turn sixty-nine as it was born in 1948, or was this the celebration of Israel turning somewhere around three-thousand-two-hundred-fifty years old from the anointing of the first King of Israel, King Saul? But that leaves out Moses which brings us to this being the three-thousand-four-hundred plus years old and even this is incomplete as the very first Israelite to live in the land of Israel was Abraham and from his founding of the start of a family, a religion, the following of Hashem and the rules he would teach to Moses all placed within Torah along with the History of a people. So the origin of the Israelite People and the Jewish religion begins with our Patriarchs and Matriarchs named Abraham, Izaak, and Jacob along with Sarah, Rebecca, Leah and Rachel. This makes this birthday approximately the four-thousand-seventeenth birthday as Abraham was estimated to have arrived in Canaan somewhere around 2000 BCE. The timeline above places Abraham appearance to be 2166 BCE, which makes our final approximation four-thousand-one-hundred-eighty-three years old, so have a happy, healthy and wonderful 4183rd birthday Nation of Israel. As we are writing this on Independence Day afternoon, we need to go to a picnic because in Israel we celebrate Independence Day much as it is everywhere, we go to morning religious services and a Bar-B-Q in the afternoon where there is lots of Kosher meat and no ice cream, it’s that meat and milk thing, so, good-bye for now.